SANTA CLARA, Calif.--(BUSINESS WIRE)--Aruba, a Hewlett Packard Enterprise company (NYSE: HPE), announced today, in concert with International Museum Day on May 18th, that more than 30 museums worldwide are using Aruba mobile-first solutions to deliver secure and reliable connectivity as well as enhance their visitors’ experiences. Similar to many organizations undergoing digital transformation, museums must keep their employees connected and reduce costs. Mobility is key to untethering staff from their desks so they can move about what are typically spacious buildings and grounds to perform their duties. It also allows these museums to perform ticket purchasing and scanning at the point of sale, using mobile devices, and removing the need for stationary ticket booths, reducing costs for the museum and expediting the process for visitors. In addition, these museums host thousands of visitors each day and want to leverage their network infrastructure to give these guests a unique and immersive experience that will ensure repeat visits. Using a combination of Aruba mobile-first solutions from gigabit wireless connectivity with Aruba access points, and Aruba ClearPass for secure guest access to location-based mobile engagement with Aruba Beacons and the Meridian App Platform, these museums are discovering new and innovative ways to provide better, more immersive and connected experiences for their visitors. Some of the museums currently using Aruba solutions include the following: Canadian Museum of History, Denver Museum of Nature & Science, Fashion Institute Museum, Intrepid Sea, Air & Space Museum, Metropolitan Museum of Modern Art, Museum of New Zealand Te Papa Tongarewa, National Museum of Australia, The National WWII Museum, Real Academia de Bellas Artes de San Fernando, and Real Jardin Botanica Madrid (Royal Botanical Garden Museum). For the Intrepid Sea, Air & Space Museum in New York, an educational and cultural non-profit institution centered on the aircraft carrier Intrepid, deploying an Aruba wireless infrastructure allowed the Museum to streamline operations, improve sales, and personalize engagement with its one million annual guests. The Museum also purchased Aruba Beacons and is using a pilot application based on the Meridian Mobile App Platform to determine how best to use mobile engagement. Royal Botanical Gardens in Madrid, Spain, is a leading attraction in the Spanish Capital, occupying 75,000 square meters of more than 30,000 species of plants, trees and flowers. With approximately 400,000 visitors each year, the popular tourist site wanted to deliver a more interactive experience that would make the riches of the gardens easier to access. Using Aruba Beacons, the Meridian Mobile App Platform and ClearPass, the Royal Botanical Gardens connected their entire indoor and outdoor space, and developed a mobile app that guides their visitors through the Gardens, allowing them to customize their itinerary, access turn-by-turn directions and benefit from personalized, multi-language educational content as they walk through the Gardens. On the back end, the Museum uses the Aruba solutions to gather granular, actionable data on visitors that will help them learn more about visitor behavior and needs, so they can develop better, more targeted marketing campaigns and promotions, as well as manage visitor flows. The National WWII Museum in New Orleans, Louisiana, has been using Aruba wired and wireless solutions to deliver a seamless Wi-Fi experience for patrons. Located in downtown New Orleans on a six-acre campus, the institution is America’s official WWII Museum, offering a variety of exhibits, on-site restoration work, a period dinner theater and restaurants. The Museum’s exhibits offer an interactive experience with simulators, oral histories, and videos to allow guests to experience the war through the eyes of the men and women who lived it. 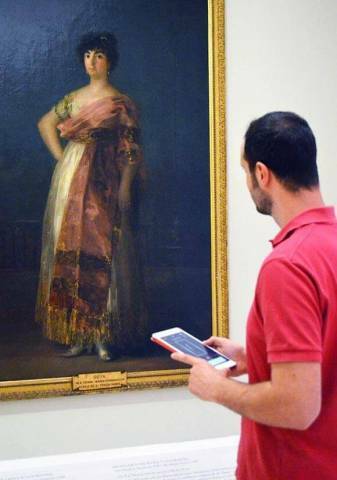 30+ museums worldwide are using Aruba mobile-first solutions to deliver secure and reliable connectivity as well as enhance the visitor experience.